Counsel for the Public Chris Aslin, left, and Tom Pappas, who works for the Office of the Public Counsel. 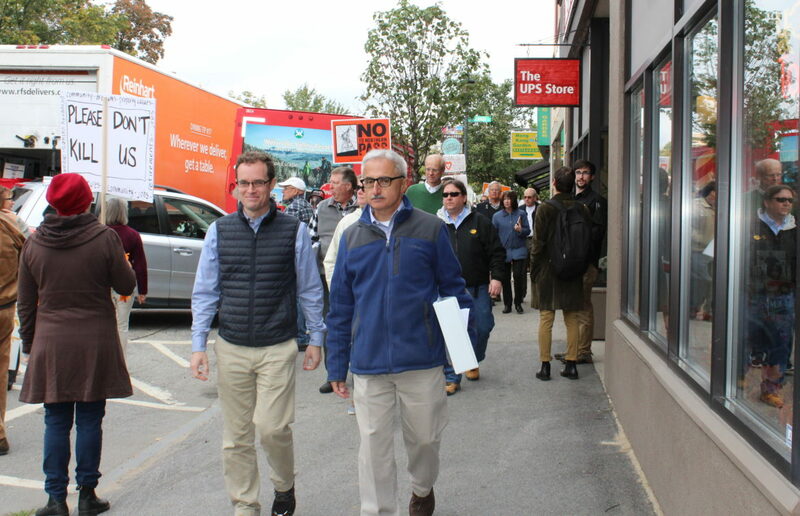 They are pictured on a Site Evaluation Committee tour of downtown Plymouth the same day opponents staged a protest on Oct. 3, 2017. CONCORD — The recusal of two members of the Site Evaluation Committee sought by supporters of the Northern Pass project asserts bias for doing what they are required to do as regulators, several intervenors said Wednesday. Similar to a filing by several municipal groups opposing the recusal motion, the Counsel for the Public states the Business Intervenor Group sites the wrong standard in making its request and uses the two members’ statements out of the context. Last month, the International Brotherhood of Electrical Workers and the Coos County Business and Employers Group, or the Business Intervenor Group, said Weathersby and Bailey made statements during deliberations indicating they could not be unbiased moving forward. Also opposing the recusal motion Wednesday, the Society for the Protection of New Hampshire Forests, said the request is flawed and inaccurate. Citing a state Supreme Court decision in Tapply & Zukatis, attorney Amy Manzelli writes there is no “basis for a bias or partiality motion unless they display a deep-seated favoritism or antagonism that would make fair judgment impossible,” and she said that is not the case. Weathersby and Bailey were explaining their opinion that because the SEC concluded the applicant failed to meet its burden on one standard, no conditions on any other standard could change this conclusion, Manzelli notes. “This is legal conclusion, not a basis for recusal,” she said. Weathersby, a Rye attorney, and Bailey, who also serves on the Public Utilities Commission, both voted to deny the project along with the other five SEC members in a unanimous vote. The SEC released it written order March 30 denying the $1.6 billion, 192-mile high-voltage transmission line from Pittsburg to Deerfield to carry Hydro-Quebec electricity to Massachusetts. Northern Pass filed its motion for rehearing last Friday and the SEC will hold deliberations on May 24 in Concord. Bailey’s comments “demonstrate a focus on the number of issues that a party could take on appeal and the ‘risks’ to the subcommittee if they continued their deliberations, rather than focusing on the appropriate procedure for evaluating the application,” the recusal motion argued. The Counsel for the Public notes the motion cites cases where there is a conflict-of-interest, which is not the issue raised. “The motion does not assert any other basis for alleged bias, such as a personal outcome in the proceedings or a conflict of interest,” the Counsel wrote. And he said the SEC members would be expected to believe an important decision they made is the right direction. “It is the desired outcome of our legal system,” according to the Counsel for the Public. Also filing motions in support of the municipal groups’ motion opposing the recusal were the Grafton County Commissioners, Deerfield abutters, and McKenna’s Purchase. The municipalities filing Monday to oppose recusal were Concord, New Hampton, Littleton, Deerfield, Pembroke, Ashland Water and Sewer, Bristol, Easton, Franconia, Northumberland, Plymouth, Sugar Hill, and Whitefield. Their lawyers are Concord Deputy City Solicitor Danielle Pacik, and attorneys Steven Whitley and Christine Fillmore. to Business Intervenor Group’s motion for recusal. The project was first proposed in 2010.